An outdoor party in commercial party tents might give guests fresh feeling and more surprises. 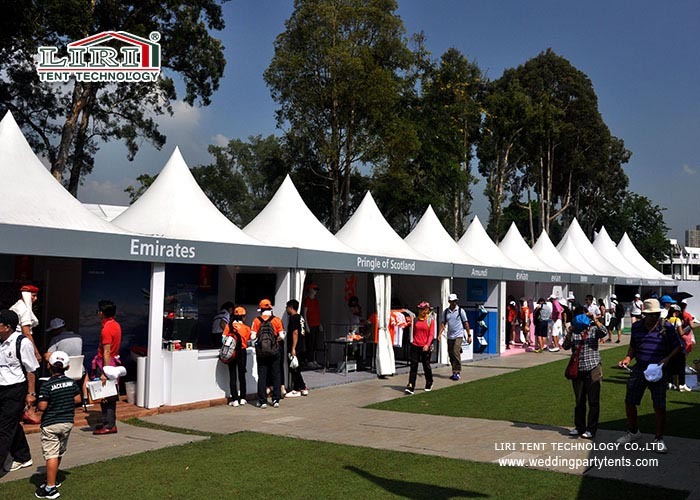 The commercial event tent cannot only compensate for the shortage of the indoor hall but also make your exhibition compelling. What’s more, its flexible modular design and exquisite look provide you unlimited innovation and imagination. However, you may worry about the strong wind, harsh sunshine, and the heavy raining. A clear span large event tent would be able to help you to solve all problems. It provides you with 100% interior space. It is waterproof, UV resistance, and wind load capacity can reach 100km/h. Liri Tent has a variety of party tents for your choice, such as pagoda tent, big tent, arcum tent, curve tent, double-decker tent and so on. Liri Tent has 6 types of clear span big exhibition tents from 10m to 60m which can meet different venues size. If you want to know more about these party tents and other more, just SEND your detailed product inquiry below. We will get back to you as soon as possible.